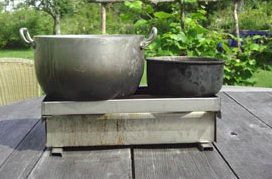 Attached you will find a prospect of the new TLUD called MUS (multi use stove). 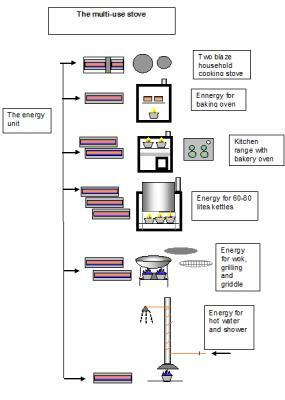 The multi-stove is not jet official tested for emission, soot and tar, but looks promising. The stove needs more testing and some design is needed before the final product is ready for production. Time-consumption can differ depending a bit on the use of one or two blaze at the same time.. It was tested informal by Aprovecho, but we made a mistake by filling both chambers at the same time so too much of the flame went outside the pan and all figures was wrong. The emission test without pan was quite low, almost the same as Peko Pe. The MUS is definitely best with pellets.